The new Yawkey Station is set to officially open -- finally -- on March 10th. It's a pretty big improvement over the old asphalt strip. And it will get service commensurate with its design: every train will stop there, which is one more than Back Bay gets. But I feel like there is a missed opportunity here. Everyone who rides the Green Line knows that on game days, when nearly 40,000 fans descend upon Fenway Park, the T is completely stuffed. Baseball games typically start just after 7pm which coincides with the pm peak. If you make the mistake of trying to use the Green Line in the Central Subway between the hours of 5pm and 7pm on a game night, you may not be able to board. I am, of course, very pleased that so many citizens and visitors choose to use public transportation or walk to get to the baseball game. I would say that the majority of the attendees do so, and that is to the great credit of Red Sox nation and the city of Boston; unlike the lunar-like surroundings of many other cities' stadiums, Fenway Park is in a walkable place. To continue to encourage this trend, the MBTA ought to be looking at opportunities to increase capacity: especially as the remaining surface parking lots get developed, finally. Fixing problems on the Green Line is welcome, certainly, but won't come cheap or easy. It needs a power system overhaul and new vehicles, just to keep up with burgeoning ridership. But those are multi-hundred-million dollar items. Now, they are putting the finishing touches on a commuter rail station adjacent to Fenway Park, intended to help serve Fenway Park and its vicinity, but will they run the service that is needed to make the investment work? A typical weeknight baseball game begins at about 7:10pm and lasts about 3 hours. Except, this is the Red Sox, so you have to figure it might go to four hours. Weekend games are known to generally start at 1pm, 4pm, 7pm, 8pm, or even 11am for the Patriots' Day game. The scheduled service is pretty miserably bad on the weekends (every 2-3 hours), so I will not focus on that too much. So, except for the very longest games, this could work. I did stay at one game, a few years back, until past 2am -- it happens -- but pretty much everyone who was time-constrained had left long before. From 7:10pm to 11:36pm is a 4:26 window but you have to factor about 20-30 minutes for people to escape from the Park itself at the end of games. However, this kind of trip isn't very useful for decongesting the Central Subway. It's not a clear win over driving to Riverside ("D" branch) either, but that route gets pretty busy as well and there may be people looking for alternatives. This is where the new schedule had much more potential to take a load off of the Green Line and I think that it failed. The Green Line and the Worcester line are not exactly parallel, but they are close, and the Worcester line connects with the Orange Line, the Red Line, and numerous commuter rail lines. This could have offered an alternative travel path for many attendees, freeing up a bit of capacity on the Green Line. Connecting between trains is a bit more of an ask, especially for people who are not typical riders, but it could be publicized and accommodated if the organizations would be willing to try. And certainly, there is a compelling offer: go this way and don't be a sardine on the overcrowded Green Line; it's cheaper and less aggravating than driving and parking. Train 535 departs South Station at 6:40pm and arrives at Yawkey Station 11 minutes later. Going back, train 540 leaves Yawkey Station at 10:47pm arriving at South Station in 10 minutes. And, train 542 leaves Yawkey Station at 12:27am. The Franklin line has departures at 10:35pm and 11:50pm, totally missing the connection. The last Fairmount train leaves at 9:40pm. The last Stoughton train is at 11pm and the last Providence train departs at 11:59pm. The last Needham train leaves at 10:30pm. The Greenbush line only has a departure at 10pm, but who rides that anyway? The last Middleboro train leaves at 10:30pm and the last Kingston train leaves at 10:40pm. Basically, the 10:47pm train from Yawkey to South Station does not mesh well with any of the other line schedules, and even the most closely timed line -- Stoughton -- will be missed if there is a delay of a minute or two. And 10:47pm may be too early a departure for a Red Sox game. So this isn't looking too great. On the other hand, the connection could still help Red Line riders, which is quite a large population. And with some changes, there is utility for Providence and Franklin line users as well. Providence train 822 arrives at South Station at 6:22pm which brings it in time to make a connection to the 6:40pm departure towards Yawkey. 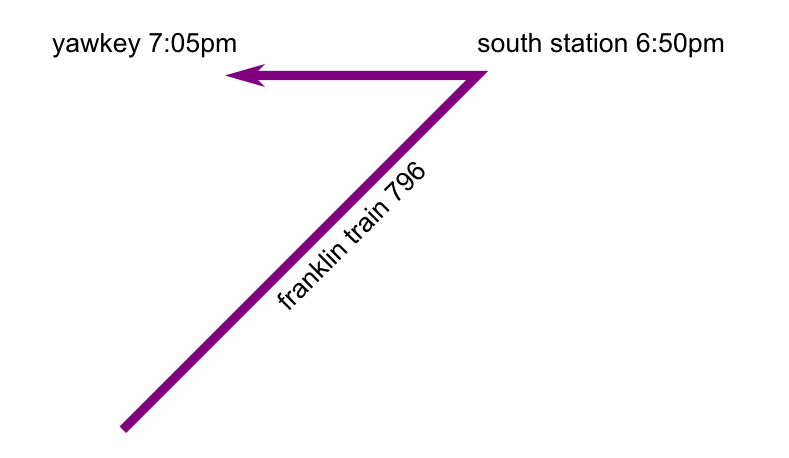 However, Franklin train 796 doesn't get there until 6:50pm, which is too late to connect. I would even recommend simply not checking tickets on the Yawkey leg of the trip, in order to speed up boarding and make things run as smoothly as possible. On the way out, a similar, special trip could be planned. A large consist could be staged and prepared to pick up passengers starting about 15-20 minutes after the last out of the 9th inning (within reason). You would not want to use DMUs for this purpose because this is exactly the sort of trip that the large capacity locomotive/passenger configuration is best for. That train would move to South Station, unload passengers, and then become a Providence or Franklin train, possibly even a special, additional trip. So, would this all work? Well, I think it would be attractive to Red Line users who are probably sick of the crush at Park Street pre- and post-game. The commuter rail is a bit more of a stretch but with some ingenuity, and publicity, it might be possible to get some significant ridership: especially if there were guaranteed connections timed around the baseball game. When I was spending some months in the San Francisco Bay Area, I often rode back on the special "game trains" that were added to the schedule after Giants games. AT&T Park is only two blocks from the 4th and King terminal. Caltrain, as any rider knows, is far from the cleverest agency in the world. But those trains were generally packed with baseball fans. Now, it's easier when you only have one line to coordinate. But this is something the T ought to be able to handle. It might even be good practice for the future, when frequent DMU shuttles will make the idea of connecting between commuter rail lines somewhat less quixotic. To me, it just seems really strange to invest so much into this transportation infrastructure, and then not put it to use when the capacity is really needed. I like to think I may be the only person to ever walk to Dodger Stadium from downtown Los Angeles. 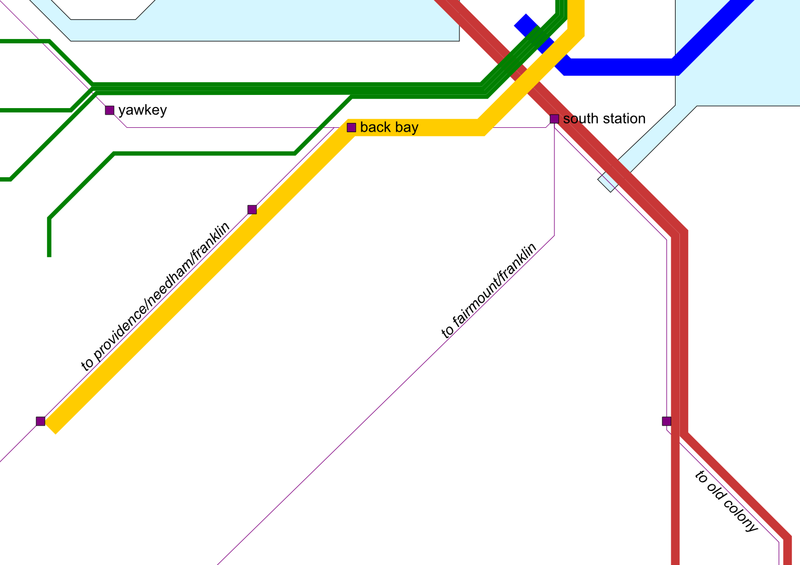 I'm praying that when the New Balance Station opens on that line, all the BU students who currently clog up the B Line will realize they can take commuter rail to Yawkey, which is basically in the heart of the BU campus. Maybe they should call it Yawkey/BU so they'll take the hint. Yawkey is already quite popular with BU folks, according to two people I know who work at BU and use Yawkey to commute from MetroWest. I don't believe that the Boston Landing station will help that much though. The number of students who live closer to the site of the new station compared to the number who live close to the Green Line or the 57 bus is small. And there won't be enough service at Boston Landing to attract students to relocate, who need all-day, good frequency to attend classes at arbitrary times. It might attract some of the ones who live over there and who bike in currently. Wrote a few months ago about various transit options to major league ballparks. Fenway definitely comes out near the top. Also, Ruggles. SW Corridor fans can get off at Ruggles and make a 15 minute walk to the ballpark.